Arts Commissioners? Click Here for: Denver Museum of Nature, Murphy Creek Fire Station, San Marcos, Texas. Video of Happiness Runs in a Circular Motion. "An engaging meditation on the sky... Turning the sculpture reflects ones' attention upward... helpful to visitors during times of challenge." 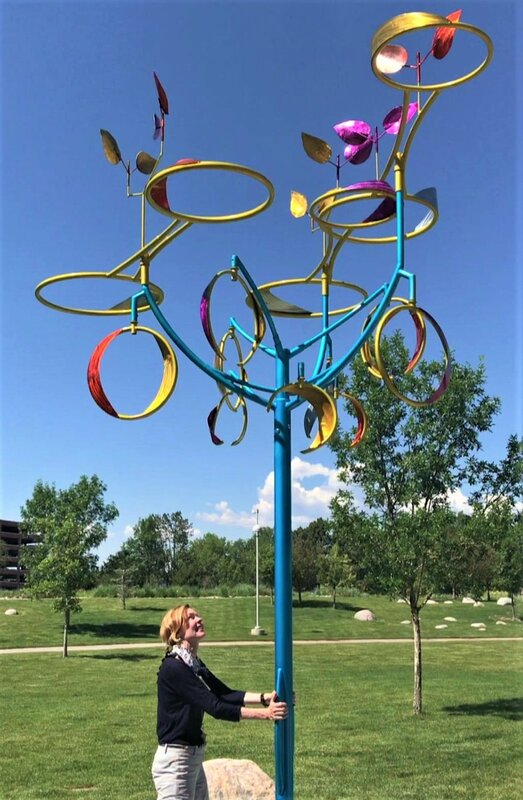 "Taking Wing"- 2016 - A wind moved sculpture on the theme of learning to fly greets students at the Main Entry to the Denver Public Schools high rise on Lincoln St. in downtown Denver. One of the requests of the Superintendent of Schools was that entry be "not corporate".